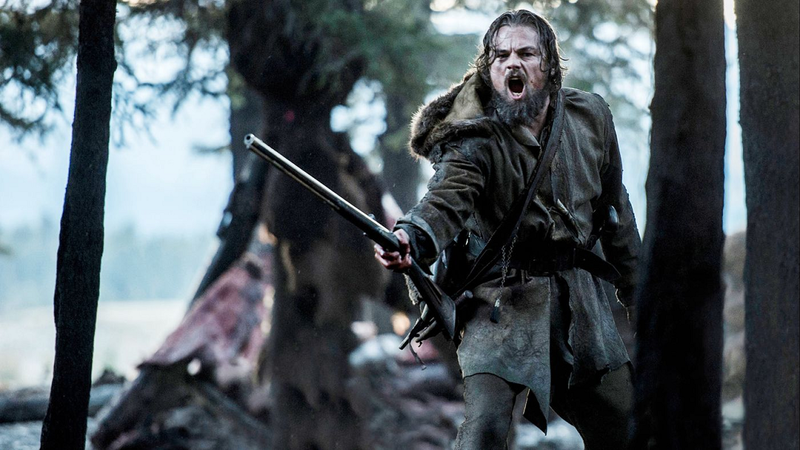 Will Leo finally win an Oscar for his role in The Revenant? Even though he thinks he probably should have won for other roles, we'll just have to wait until February 28. I suggest you go out and see this movie, and not just because it's a Leonardo DiCaprio movie, but because it's kind of based on a true story. And once you see this film after knowing that these events actually happened to a real person, then you'll appreciate it even more. A revenant is defined as a person who has returned, especially supposedly from the dead. And that's what Leo does in this film. His character is a frontiersman in the early 1800s who is traveling with a hunting team. One day, he gets brutally attacked by a grisly bear, and a few members of his team are told to stay behind with him while his wounds heal. But one member decides to look out for himself instead and leave a half dead Leo to die. It's then up to Leo to find a way to survive from his life threatening wounds, while making his way through the bitter cold wilderness to seek revenge. A great performane is given by DiCaprio -- who, albeit, spends most of the more than two hour movie crawling on his stomach, mumbling and eating. But an equally great performance comes from Tom Hardy, who plays his betrayer, and who is also nominated for his role in this film. If you don't like movies that focus heavily on cinematography then The Revenant is not for you. It also drags in the middle, which doesn't help a movie that's already approaching the three hour mark. But if you're looking for one of the most intense scenes you'll ever see in any movie this year (yes, I feel confident saying that even though it's only January), and quite possibly the best shot that Leo has for finally winning an Oscar, then put this film on your list. I love DiCaprio, he's an amazing actor. This movie is definitely on my list! I am not the best at appreciating cinematography and graphics in movies lol, but i thought it was ok. I actually watched it because my brother who appreciates good movies much more than i do recommended. DiCaprio did very well indeed and i am glad i watched it. I wasn't considering this movie, but looks like I might need to! I have yet to see the movie but it's on my list to go see. I heard the cinematography is amazing. Especially since everything was shot in natural light.